Featuring blue in your decor evokes feelings of calmness and serenity. It’s the perfect choice to bring tranquility to any room in your home. Here, our top blue decorating ideas. There are many shades of blue that are perfect for dining rooms. This shade of blue with a hint of gray pairs well with the formal setting. If you do want all-over color, paint the walls and ceilings the same hue to bring everything together in the room. Paint: Covington Blue (HC-138, semitransparent stain) by Benjamin Moore; benjaminmoore.com. 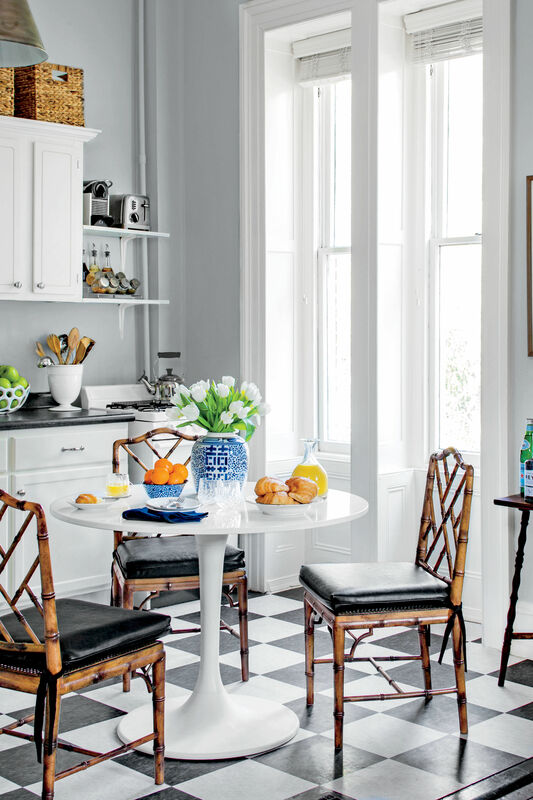 Walls and ceilings splashed in similar soft shades of blue in this kitchen create a cohesive, balanced look. Wall Paint: Covington Blue (HC-138, semitransparent stain) by Benjamin Moore; benjaminmoore.com. Ceiling Paint: Nantucket Gray (HC-111, semitransparent stain) by Benjamin Moore; benjaminmoore.com. Match dark wood with a light hue, such as this shade of blue, to balance the weight of the furniture in the room. Wall paint: Fantasy Blue (716) by Benjamin Moore; benjaminmoore.com. Three shades of blue from the same color card drench the floor, cabinets, and walls of this coastal kitchen. Paint: Tear Drop 2060-70, Cayman Blue 2060-50, and Toronto Blue 2060-40 by Benjamin Moore; benjaminmoore.com. The calming shade of blue in this bath painted only on the ceiling enlarges the room. Paint: Rain (SW6219) by Sherwin-Williams; sherwin-williams.com. Mix a strong shade of blue with bold fabric to enliven a room. Paint: Stratton Blue (HC-142) by Benjamin Moore; benjaminmoore.com. Curtain and bench fabric: Venice in chocolate by Michael Devine Hand Printed Fabrics; michaeldevinehome.com. The light shade of blue in this bath pairs well with the black trim and white tile to make the room look light and airy. Paint: Fantasy Blue (716) by Benjamin Moore; benjaminmoore.com. Tiles: custom installation by American Restoration Tile; restorationtile.com. Blue and gray tones tie together the mix of metals and natural wood in this kitchen. Paint: Eider White (SW7014) by Sherwin-Williams; sherwin-williams.com. Cabinetry and blue wall paint: Stratton Blue (HC-142) by Benjamin Moore; benjaminmoore.com. Get creative by using a seagrass wallcovering to incorporate both texture and rich color. Paint: Wallcovering: 77-TR-109 by Sonia's Place, available through Design Professionals; 212/759-5408. A coat of paint on the remaining built-in, in the same color as the walls, better unifies the area with the room. Choose a magnetic chalkboard paint, such as this rich blue shade, for the back wall, which adds color and functionality. Chalkboard paint: Chalkboard paint in Deep Ocean (#24) by Hudson Paint; hudsonpaint.com. Magnetic paint: Specialty Magnetic Latex Primer (115535) by Rust-Oleum, available from Lowe’s; lowes.com. 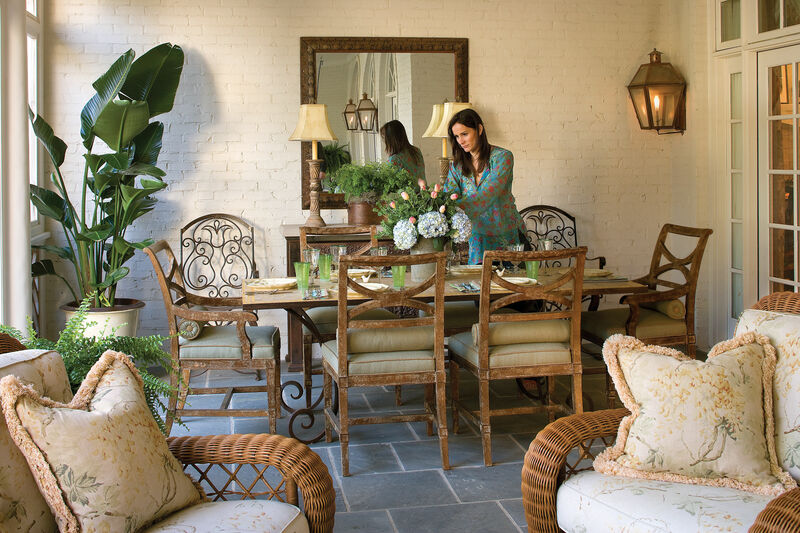 Muted hues of blue and green give the room a serene and beachy feel. Simple details like the finish of your linens help set the tone of your dining space. Pair a nuetral-tone linen with a dark blue wall paint for an elegant finish. Color can add cottage charm and set a laid-back vibe that’s perfect for beach or lake houses. This refreshing hue transformed a once rustic space, keeping the room fresh and light. Paint: Wythe Blue (HC-143) by Benjamin Moore; benjaminmoore.com. Vivid hues add richness to small spaces. If you shy away from darker colors, try them out in a bath or laundry room. Paint: Waterscape (SW6470) by Sherwin-Williams; sherwin-williams.com. A shade of light blue adds a modern edge to the rustic wood panels in this entryway. A geometric flat weave is more casual and youthful than a heavy Oriental or wool rug. Balance it out with a large piece of modern art framed in a simple white gallery frame. Finish with blue glass lamps or a pretty bowl to add sparkle and dimension.